Homemade candy always has a special place in my heart. Actually, candy (period) has a special place in my heart. I was never a big candy eater, but I did have my favorites that I always enjoyed on those “candy-centered” holidays like Halloween, Easter, Valentine’s day. You could always please me with an Almond Joy or Mounds bar. 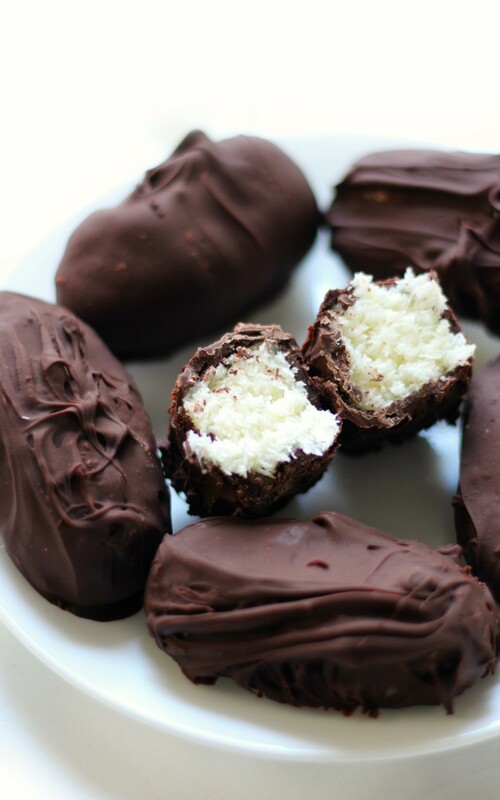 Chocolate-covered, sticky sweet coconut? Yes, please, I will gladly accept! 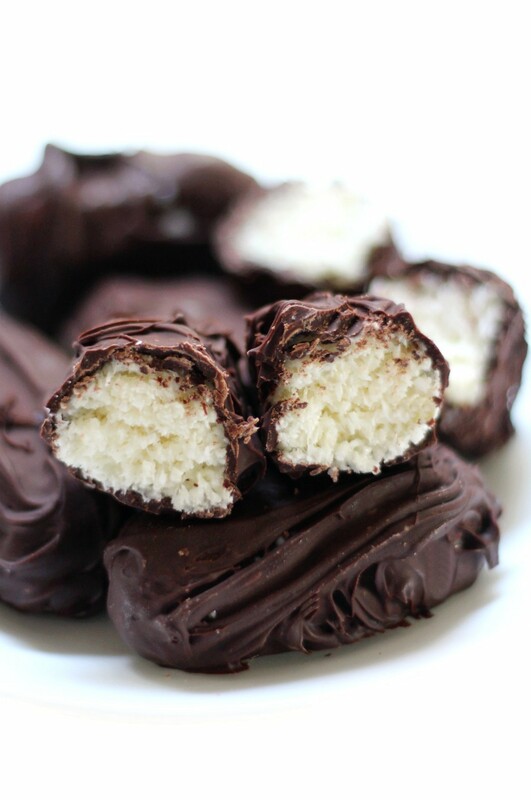 Everyone always thought I loved Almond Joys more than Mounds (if you don’t know, an Almond Joy is the exact same candy bar, but with a single whole almond on top of the coconut, right under the chocolate coating.) but I actually loved Mounds more. Everyone thought my brother was the one who loved the Mounds and my the Almond Joys and thus, would give me the latter and him the former. It always made me angry. Not that they weren’t still delish, but they were less enjoyable to eat with the random crunchy dry almond. You win some, you lose some in life. But hey, at least now I can have all the Mounds I want! Gluten-free, vegan, paleo, allergy-free, nothing artificial or “scary”. You know, we could always throw an almond on here too, if that craving for an Almond Joy did happen to hit. Keeping these top-8 allergy-free, no nuts allowed, though! Low and behold, I didn’t even make these with the intention of appeasing my own Mounds craving; I made them for my brother (and mom) for Christmas last year! I’d actually (embarrassingly) been working on this recipe for homemade Mounds bars since the summer. So many messy, sticky, chocolatey, failed attempts that only produced coconut chocolate slop. Why did it fail SO many times? Well I wanted to keep it simple (i.e. only 4 ingredients) and obviously I was not using someone else’s recipe, so I was winging it. But I kept missing one crucial step. You must FREEZE before you DIP! 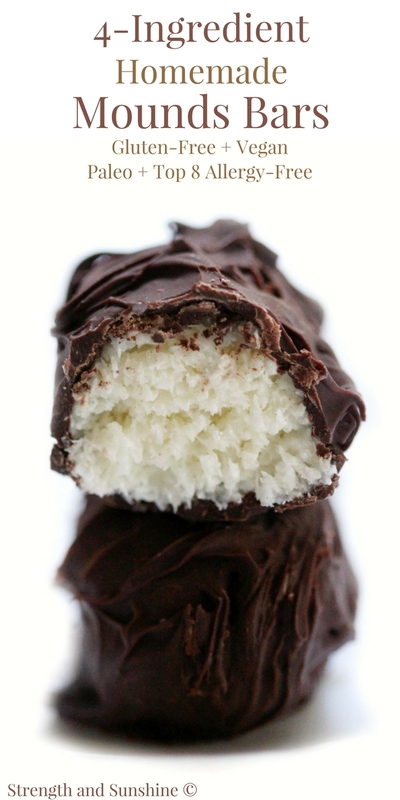 You form your coconut bars of shredded coconut and condensed coconut milk, but you need to freeze them to firm up BEFORE you try coating them in melted dark chocolate! Otherwise they just fall right apart in the chocolate. When i figured that mystery out….just shame. But that’s my job! 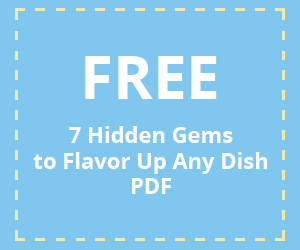 To test things out, find the right method, and then share the winning recipe with you so you don’t have to deal with the trail-and-error hassle of recipe development! 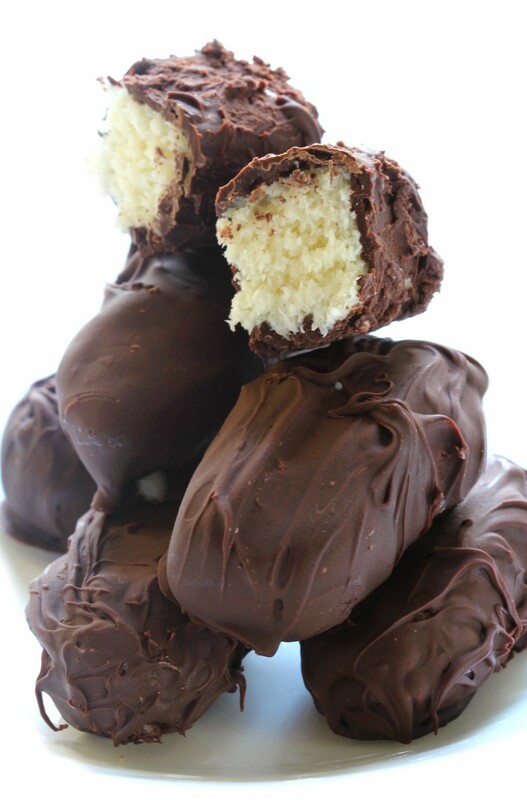 So without further delay, let me give you the EXACT winning steps to homemade Mounds success! In a large bowl, mix together the shredded coconut, condensed coconut milk, and erythritol until you get a sticky coconut “dough”. Use your hands to form about 14 (2 tablespoons each) coconut logs/bars and place then on a wax paper lined baking sheet (or large flat plate). Freeze overnight (or at least 3-4 hours). In a greased microwave-safe bowl, melt the dark chocolate chips (mixing at 30 seconds intervals works best). Allow the melted chocolate to come to room temperature before using two forks to dip and coat the firm coconut bars you had in the freezer. 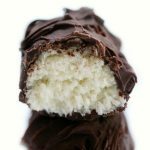 Place the, now coated in chocolate, coconut bars back on the wax paper sheets and refreeze until you are ready to consume. You can keep them in the refrigerator for 4-5 days, but freezer is best. + I think it’s a sibling dilemma, but do you have one of those “everyone thinks I like this, but I really like that” situations? Looks fabulous! I’d like to try these, but my daughter does not do well with artificial sweeteners. 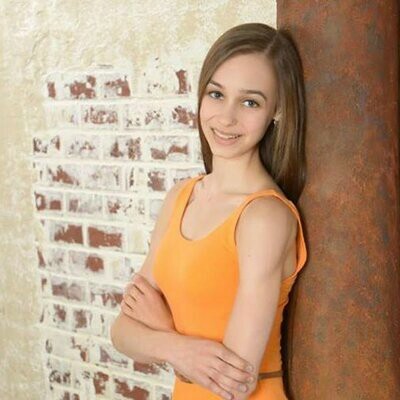 She has celiac and needs to be dairy free, but not paleo, so sugar is okay for her. If I substitute the sweetener with sugar, how much would it take? Thank you so much! The amount of time it took you to type this comment, you could have read the post and recipe which it clearly states. You always have such amazing recipes! I’m so glad that you persisted with the recipe because you clearly cracked it in the end. They look AMAZING!!! I used to love Bounty Bars as a kind, but I haven’t had one in decades due to my dairy allergy. It’s fantastic to know that they can be made vegan AND only with 4 ingredients. You’re a genius! 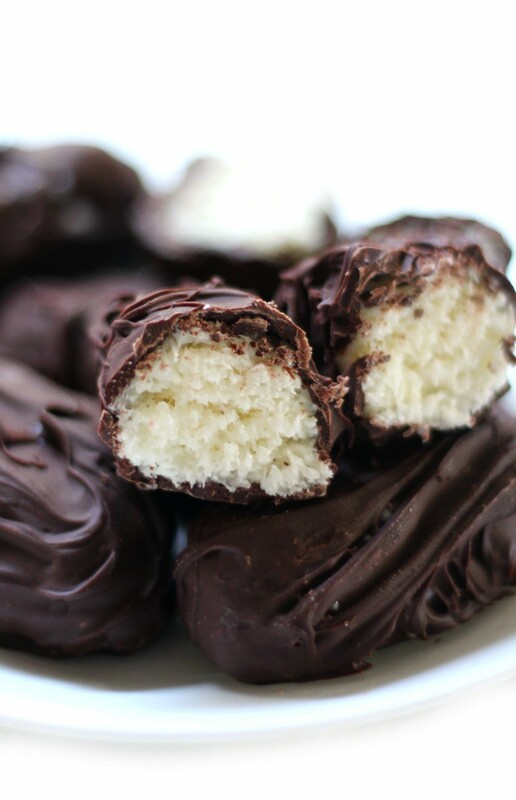 Nothing can keep us away from the chocolate & coconut combo! Awesome! I know you’ll enjoy them as they’re even better fresh and homemade! You just rocked my chocolate world, Rebecca!!! 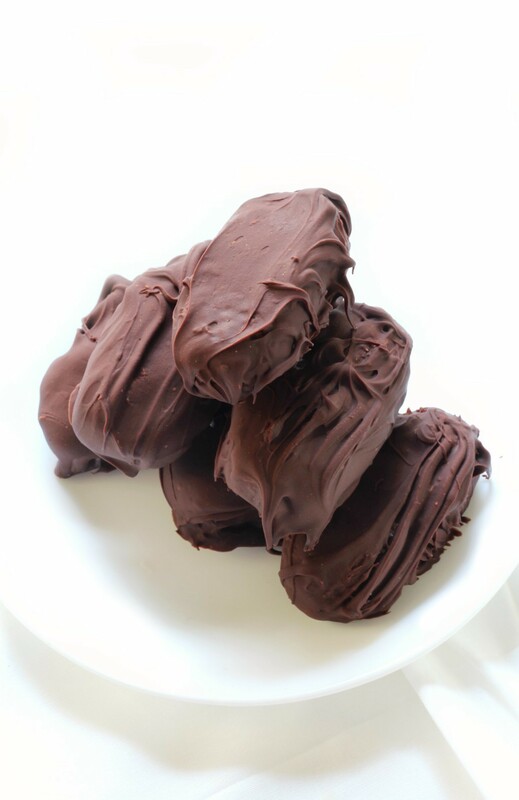 Mounds or Bounty bars are my favorites, but I stopped it them years ago because of all the chemicals and certain ingredients, thank you for giving me an easy recipe to make them. Sharing. Awesome! Well I hope you enjoy these! Wow! These do look delicious Rebecca. We have “Bounty” bars here that are similar to these. I’ve always thought about making my own and now I can with this recipe. Thank you! Oh wow! These look so good! And so easy to make. I will have to try them. Pretty easy once you get the method! I love Mounds! And these sound so easy to make, and maybe even a little healthier(??). Wishful thinking? I think so 😉 No junk in these! Condensed coconut milk?? I didn’t even know that was a thing! Need to find it now! Of course it is! You can make it homemade too, just like any condensed milk. Thank you! Time to go make some! This looks like an excellent paleo treat! Especially with Easter right around the corner. Yes! Fill those Easter baskets! Yummy!!! What a great idea! We call these bounty bars and I love them. I really must try making my own. Have to look out for the coconut condensed milk. Shared! You can make your own condensed coconut milk too! Reading this post made me so hungry!!!! I can’t wait to try this at home. Haha! Well enjoy some homemade candy soon! These look so good!!! I cannot wait to try these out! How yummy! I think that its so great that these have only four ingredients! Can’t keep us away from the Mounds! Love this! I saved to make later with my daughter. We are gluten-free and dairy free household. It is often difficult. I look forward to all your suggestions so we can mix it up! Thanks ! These will be a great treat! My mom’s birthday is next month and she would LOVE these!! I may just have to make her some! OMG! These look delicious! Can’t wait to try them! Oh wow, this looks amazing. I do love a Mounds bar, especially the ones with dark chocolate. 🙂 Thanks for sharing. Lol, well they are only made with dark chocolate. Really? I always thought they had milk and dark. hah Well, I still love Mounds. These look so good! I love mounds. Right? They are the best! These look like heaven! I’m pinning this recipe! I am drooling! These look amazing. I love making treats healthier. Yum! And I love that their allergy friendly to boot. Yes! We all need safe candy! these are soooooooo delicious ! And I didn’t even know you could make them like this. Thanks for the step by step guide. Really helpful. I love how simple they are too! Thanks!